Department of Physics at the University of California at Berkeley, and Faculty Senior Scientist at the Lawrence Berkeley Laboratory, where I am also associated with the Institute for Nuclear and Particle Astrophysics. Don't confuse me with Richard S. Muller. For a more interesting photo, click on the image. 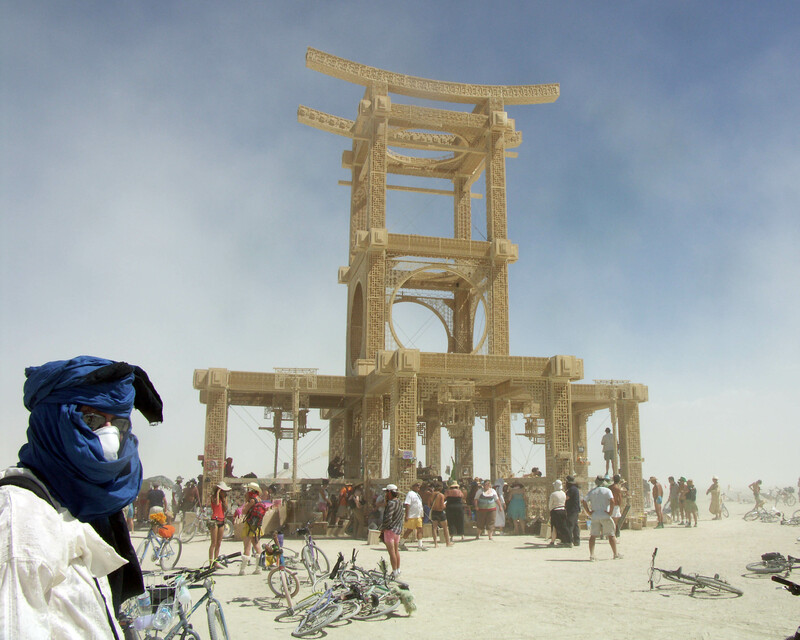 For a high-res jpeg of the photo on the left, click here. You can also jump to current research. Global Warming News: Elizabeth and I were recently interviewed by Lt. Gov. Gavin Newsom. We discussed global warming and what solutions potentially exist. You can watch the interview here. What is most remarkable about this interview is that in 15 minutes we covered all of the most important topics. Great job, Mr. Lt. Governor! 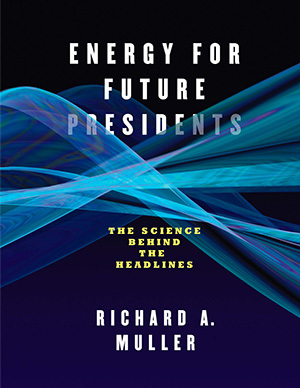 My new book "Energy for Future Presidents" is now shipping from Amazon, and is also available from your local bookstore. It includes analysis of Fukushima, the Gulf Oil Spill, Global Warming (including the new Berkeley Earth results), the natural gas revolution. 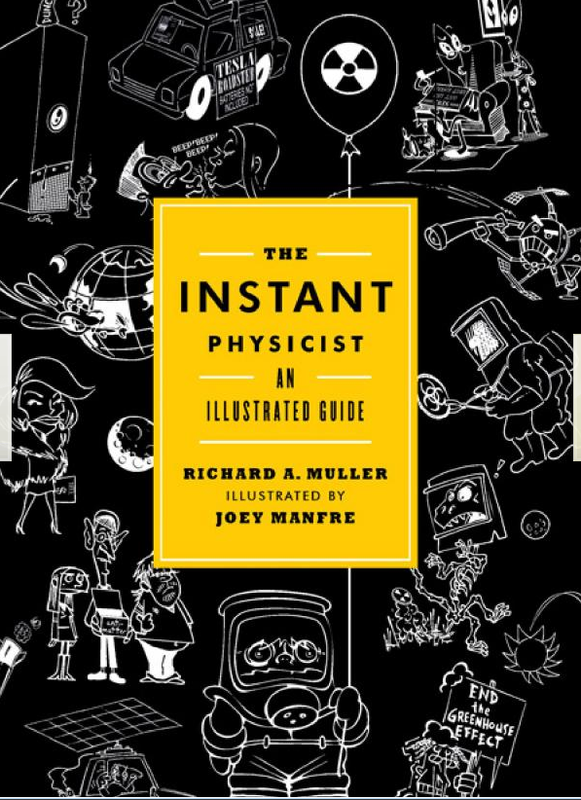 My older book, The Instant Physicist, is still available for $11 to $13 at Amazon, Barnes & Noble, Borders, Powell's, and Indiebound. Amazon and B&N show sample pages including the great art of Joey Manfre. Listen to my interviews about the book on KQED FM: Forum and on CBS radio. Humor and Physics do mix! Global Warming. We have begun a new major research project to make an independent evalution of global warming through a careful analysis of the most complete set ever used of land surface temperature measurements. For details, see BerkeleyEarth.org. See Physics for Future Presidents web page about the course I teach. Princeton University Press has now published the full color, glossy, yet cheap ($44.35 on Amazon) textbook Physics and Technology for Future Presidents. See my movie of the Finale of the Paul McCartney Concert (10 July 2010). See Rich on the Glenn Beck show, discussing the Iranian nuclear threat. The discussion took place Friday 5 Feb 2010. Beck says: "I have read your book. It is fantastic. Everybody should read this book if you are interested in science at all and you're interested in the future." But he doesn't like the part on Global Warming. Naked Copenhagen my Op-Ed piece has now appeared in the Wall St. Journal. For details of the calculations, go to MullerandAssociates.com. See a photo of Barack Obama reading my popular book! 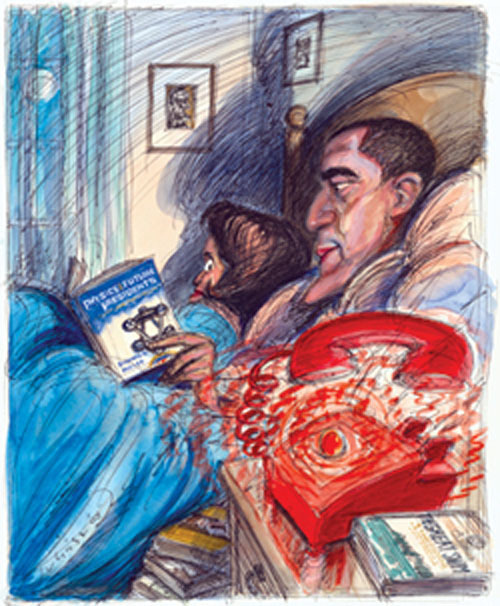 -- while in bed -- and being so distracted that he ignores the ringing red phone -- while Michelle looks on with concern. Well, OK, maybe it isn't a photo. It was done by Victor Juhasz. See the image here. 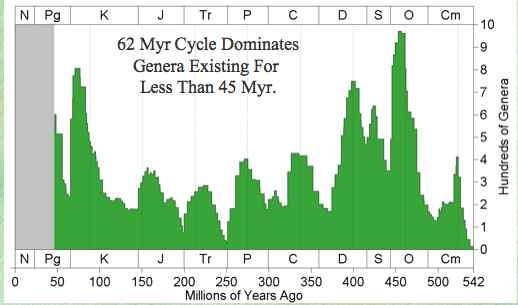 Cycles in Fossil Diversity. Our discovery of the 62 Myr cycle was published in 2005, but now we present the data parsed in 171 different ways! See below. There are two books I have written with similar titles. Physics for Future Presidents is written for popular readers -- meant to be read rather than studied, is shown on the left. I've been on NPR twice answering call-ins: listen to Michael Krasny on Forum or Tom Ashbrook's "On Point". It is now available in paperback (cheap). The more detailed book, a textbook for my course, is on the right side. The popular version has five sections: terrorism, energy, nukes, space, and global warming. The new Princeton University Press text has 13 chapters including a new one on climate change, multiple choice and essay questions, and is suitable for a course, Interested in teaching from it? 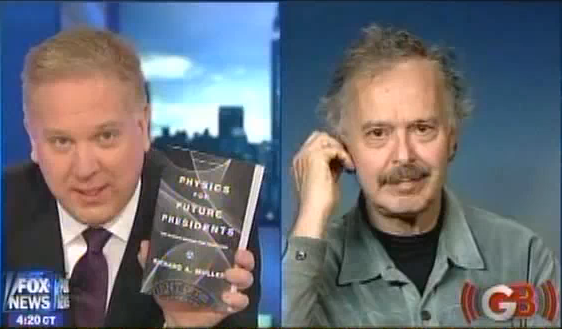 Here is a link: Physics and Technology for Future Presidents. We've kept the price under $50. 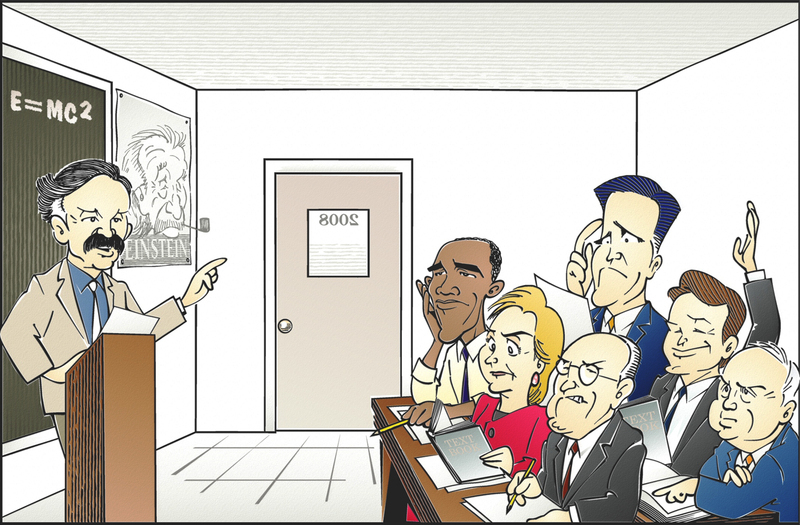 Muller teaches physics to Hillary Clinton, Barack Obama, John McCain, and other candidates (photo taken by Joey Manfre). Science Magazine piece about UC Berkeley's success in broadcasting my lectures on YouTube. A soldier in Iraq listened to my physics lectures while manning a .50-caliber machine-gun and watching over a goat herder's field where insurgents were suspected of passing through a week earlier. Read the whole story. Watch the TV clip about my class Physics for future Presidents that was on ABC7 News on May 21, 2007. Go to: Top Universities Offer Free Lectures Online. Muller's Theorems. The complete list is now posted. Photos from our August 2007 backpack trip to Hoover Wilderness and the Virginia Canyon in Yosemite. Historic FSM photos inside Sproul Hall, Dec 3-4, 1964. For the first time, I have posted the photographs I took during the Free Speech Movement Sproul Hall sit in. These include images of Mario Savio, Jack Weinberg, and Joan Baez in the corridors of Sproul. They also show the police charging up the stairs to take control of the window on the second floor, a window that was being used to take food and information in from outside sympathizers. I was arrested, and spent the next night in the Oakland jail. When I was released, to my amazement, the police returned the film to me. I was the only student arrested who later became a professor at Cal. Nobel Prize. Congratulations to John Mather and George Smoot for the Nobel Prize in Physics, awarded for their work on COBE. I've posted a new pre-COBE history page that includes historically interesting documents that are relevant to the genesis of COBE. These date from the days when I was the Principal Investigator on the U-2 project that discovered the cosine anisotropy of the cosmic microwave background radiation. Physics for future Presidents, my course (see below) has a textbook, available from Thomson Publishing. It is also available on Amazon, for a higher price, but you might need to make sure you get the right edition. The newer version says "Spring 2008 edition" on the cover. Wildlife photos from our recent trip to Kenya and Rwanda. Click the following link to download a pdf file that shows the diversity data parsed in 171 different ways. If you are familiar with paleontology, then these data may give you the clue that you need to figure out what is causing the cycle. Avalanches at the Core-Mantle Boundary, has been published in Geophysical Research Letters, vol.29, pg 41-1 to 41-4 (12 Oct 2002). Such avalanches may affect geomagnetic reversals and flood basalts. They can be spontaneous, or triggered by oblique impacts of comets and asteroids. Nemesis. This is a theory worked out with Marc Davis and Piet Hut. It predicts the future discovery of a small (probably red dwarf) star orbiting the Sun at a distance of a few light years. The theory has been considered controversial and speculative, but it has not yet been ruled out. We should know for sure in the next few years. I wrote an article about our work for the New York Times Magazine in 1985; here is a transcript: NYTimes Article. See the Nemesis web page. See also "Measurements of lunar impacts ... and implications for the Nemesis theory." We have measured the accretion of extraterrestrial dust by using iridium measurements on Greenland ice. The results are controversial: we found a lower level of accretion than had generally been believed. Read our article.pdf published in Geochimica et Cosmochimica Acta. Ice Ages and Astronomical Causes (with coauthor Gordon MacDonald) published by Springer-Praxis in 2000. Click to read the Table of Contents, the Preface or Chapter 1, which contains brief introductions to the History of Climate, Ice Age Theories, and Spectra. It is meant for students or researchers who want to learn how to do spectral analysis of paleoclimate data.It can be ordered from Amazon.com, from Springer New York, Springer Germany, and from Amazon in the UK. . For see the wonderful movie illustrating the changing orbits. I've posted a table of the Earth's orbital inclination for the last 3 Myr. See the new compilation of ice age data we call the Benthic Stack, published in Paleoceanography (vol 17, 2002). It was tuned to obliquity alone, and represents a new view of climate for the last 860 kyr. Physics for future Presidents is my name for Physics 10, cross listed as L&S C70V, is the course I currently teach. In one semester, my goal is to cover the physics that future world leaders need to know (and maybe present world leaders too). Go to the PffP home page to read selections from my textbook. It can be purchased at a discount. from Thomson Publishing. And read the article in the San Francisco Chronicle. The Physics of Gluttony (Nov '04). You lose weight (carbon) only by breathing. Global Warming Bombshell (Oct '04). Global warming poster child discredited. Death of the Dinosaurs (Aug '04). There's a lot more we don't know now. Military Lessons from Iraq War II (July '04). Some may surprise you. Dirty Bombs (June '04). My greatest fear is fear itself. Less Lethal Weapons (May '04). Are they good or bad? Alaska is melting. Can Kyoto save it? (April '04). Climate is local too. The Witch of Yucca Mountain (March '04). Research won't reassure. Our Non-expedition to Mars (Feb '04). Mars in 26 years? Only after robots. The Voice of Osama (Jan '04). Why I think it isn't his. Medieval Global Warming (Dec '03). Medieval climate becomes politicized. Bizarre Math of Elections (Oct '03). Low voter turnout may be a healthy sign. Cuba Low-Tech (Sept '03). Observations from my visit to Cuba. When Lie Detectors Lie - or Don't (August '03) They do have valid uses. Hydrogen Economy Pollution (July '03) Not as clean as you might think. Deceiving Saddam (June '03) To fool someone, you may have to fool all. The Weapons Paradox (May '03). Are kinder, gentler weapons, always evil? Shock and Awe in Babylon (April '03) Early surprises in Gulf War II. Baghdad Express (March '03) A weapon of mass transport? Space Shuttle Science (Feb '03) Is it safe? Is it science? Analysis of the Terrorist Attack, posted Sept 16 2001, 5 days after 9-11. The War on Terrorism posted Sept 21, 2001, with my predictions. The terrorist threat is over, for now posted Oct 26, 2001. Physics of Terrorism, Counterterrorism, and the Conflict with Iraq. Read my essay The Physics Diet translated to Belorussian. The Instant Physicist (Norton, 2010). Physics and Technology for Future Presidents, a textbook for my course, has been published by Princeton University Press, 2010. Nemesis (Weidenfeld & Nicolson, 1988). Read Chapter 1: Cosmic Terrorist. Copies of the book are available used on Amazon. The Sins of Jesus, a historical novel. You may download selected chapters from this novel for free. Click here for more information. The Three Big Bangs (with coauthor Phil Dauber, Addison/Wesley 1996). Read Chapter 1. Ice Ages and Astronomical Causes: data, spectral analysis, and mechanisms (with coauthor Gordon MacDonald). For sample chapters, see the note posted above. Fellow of the American Academy of Arts and Sciences. (That's special; there are only 218 other physicists.) Teaching awards include the 1999 Distinguished Teaching Award of the University of California (for teaching physics majors), the 2009 Noyce Prize, and the 2010 Phi Beta Kappa Excellence in Teaching Award for Northern California. My other awards include the Mac Arthur Prize (1982), the NSF Alan T. Waterman Award, and the Texas Instruments Foundation Founders Prize. A complete list is here. 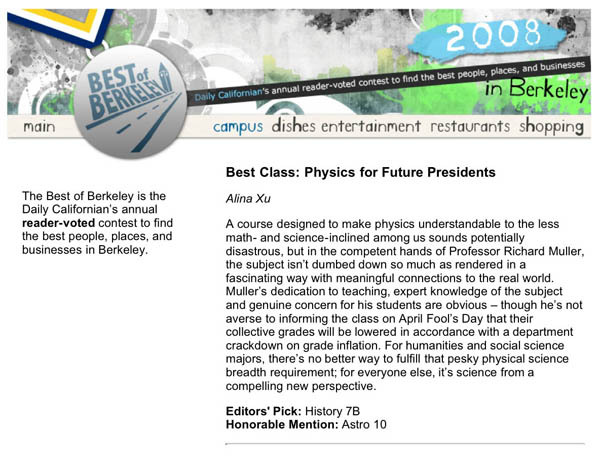 My class Physics for Future Presidents was voted "Best Class on Campus" in 2008 and 2009. 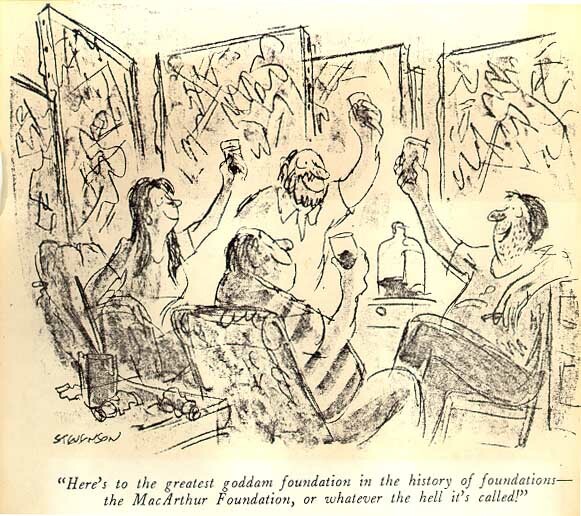 My feeling about the MacArthur Award is best expressed by a cartoon from the New Yorker. Kenya and Rwanda wildlife May & June 2006. LOST. I waste at least one hour each week watching the ABC TV series LOST. I am now (April 21, 2010) posting some predictions for the ending, which is a month away. We will soon learn that the island has moved many times in the past. Best guess: it started near the Nile; hence the Egyptian statues and hieroglyphics. It spent some time in the Roman Empire; that's when the residents picked up the tradition of speaking Latin. On one of its travels it landed in the Atlantic Ocean. Then it moved again -- disappeared -- and the legend of Atlantis was born. Jacob -- or his replacement (possibly Aaron, traveling back from the future)-- will have the ability to turn into a "white smoke monster". The final battle will be between the white smoke monster and the black smoke monster. You can also read, from last season, my explanation of how Ben moved the island, published in Popular Mechanics online. My wife Rosemary has her own architecture firm Muller & Caulfield. Among her recent projects is the new Thousand Oaks Elementary School in Berkeley. She is now designing a new courthouse for Alameda County. GreenGov.biz helps nations prepare for Copenhagen, work towards energy security, and it helps companies sort out the confusion about global warming and energy. I enjoy skiing, backpacking, photography, magic, and racquetball. (See the now inactive physics racquetball challenge ladder and the racquetball rankings. For photos of some of my colleagues, collaborators, and former students, visit the gallery. 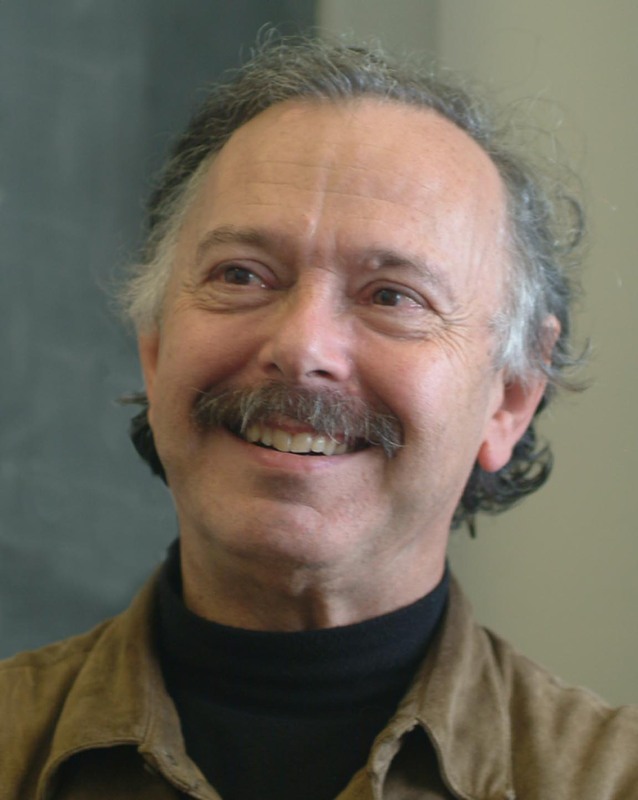 I am sometimes confused with my namesake, Richard S. Muller, who is a professor in EECS, and director of the Berkeley Sensor and Actuator Center. But although our interests overlap, Richard S has no mustache. Yes, for six years, 1976-1982, I owned a restaurant called Inn Season. It was the craziest thing I ever did. You can see the announcement of opening, a sample menu, or just the logo. If anyone near and dear to you wants to open a restaurant, I can now be hired to talk them out of it. The restaurant was purchased and reopened as the Nagapan restaurant. And, for the few who care, here are the complete lyrics to songs from the great movie ISHTAR. Craig Kenton Smith, my former graduate student, has been working in microwave remote sensing physics and algorithm development since 1997, and it currently with The Aerospace Corporation. Jonathan Levine my former graduate student, is an assistant professor at Colgate. Dan Karner earned his Ph.D. in Geology and Geophysics, and worked with me on Quaternary glacial cycles, glacial ice measurements, and everything else. Piet Hut is tenured, but the Institute for Advanced Study tried to fire him. Read my statement. Walter Alvarez and I frequently hold a joint group meetings and talk about AstroGeophysics. Society for Amateur Scientists, created by my former student and postdoc, Shawn Carlson. Hands on Universe. High School students can control professional astronomical telescopes. Distant supernova search. My former graduate student and post-doc Saul Perlmutter discovered that the Universe will expand forever! Amigos de las Americas is a volunteer program that my daughter Melinda participated in. In 1998, she went to Paraguay for six weeks to dig latrines, teach improved sanitation methods, learn first-hand what a foreign (and third world) land is like, and perfect her Spanish. In 1999, she went to the Dominican Republic, for similarly heroic feats. My friend Tony Long recently wrote a fascinating paper called "Evolution vs Intelligent Design in Classical Antiquity". With his permission, I have posted it on this web site. My former student Shawn Carlson published in Nature magazine the definitive scientific test of Astrology. Although his paper is widely cited, it is not as well-known as it deserves. (I am proud to have been his scientific advisor in this work.) He subsequently founded the Society of Amateur Scientists and was appropriately given a MacArthur Foundation "genius" award. If you have questions about his test of astrology, please email Carlson, not me.